During my recent visit to Costa Rica on an invitation from Fundecooperacion, Asociacion Coordinadora lndigena y Campesina de Agroforesteria Comunitaria Centroamericana (ACICAFOC) and the National Institute for Innovation and Transfer of Agricultural Technology (INTA), Ministry of Agriculture, Costa Rica, I had an opportunity to meet organic farmers again. 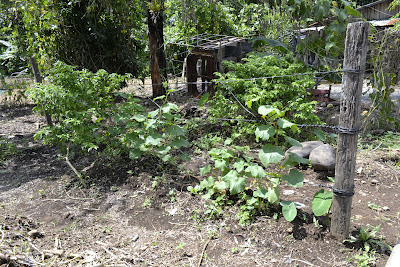 During 2010 I conducted few workshops on low-cost sustainable agriculture utilizing the local resources. The aim was to transform farming into a profitable venture by reducing the dependence on the external farm inputs like seeds, manures and pesticides without compromising on quantity and quality of the produce per unit area of farm land. Organic agriculture to a large extent has become substitution farming. Prior to turning organic, farmers were fully dependant on hybrid seeds, chemical fertilizers, herbicides, pesticides and other agro-chemicals. After turning to organic the dependence has not stopped, rather than chemicals the farmers are now dependent on organic composts, bio-pesticides and a series of products that are marketed for organic farming. At times I wonder is it Organic Agriculture in its true spirit? Woefully it doesn’t fit into the concept and philosophy of organic or sustainable agriculture. Farming needs to be sustainable and farmers also need to be sustainable. By efficiently utilizing the natural resources farming and farmers can be sustainable. Organic farming is a “knowledge intensive system” and not input intensive. Understanding different approaches to address the seed, nutrition and pest/disease problems in agriculture is key to sustainability. Ms. Maria Luisa and many women farmers from Costa Rica attended my workshop on low-cost agriculture in 2010 organized by INTA. Practical hands on training on various low-cost approaches helped the farmers to understand the resources which were considered as wastes. These smart farmers used their ingenuity and innovation to adapt these low-cost technologies to suit their conditions. 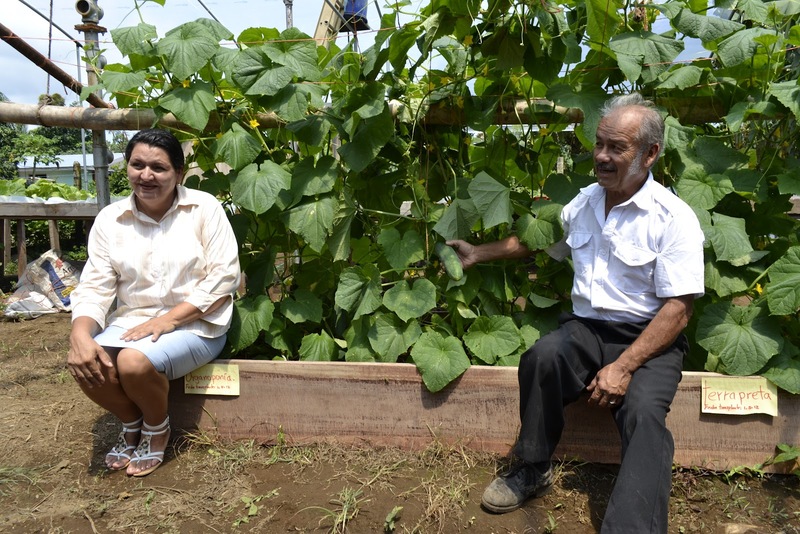 Maria use to follow hydroponics to cultivate vegetables. Hydroponics is a technique wherein in the plants are grown on an artificial media or coir pith and nutrition is provided in a solution form. The commercially available preparations are purchased by the farmers and are made into a solution and sprayed regularly. Though it is an efficient system but quite expensive as the farmers have to regularly purchase these solutions and not sustainable. At times it is unable to address the trace element deficiency symptoms observed in plants. After learning the different preparations of utilizing the natural resources, Maria uses the fermented plant extracts from different plants which are grown as weeds and sprays her crops. By this technique she is efficiently utilizing the weeds but also reducing the cost of production by being least dependant on the purchased inputs. 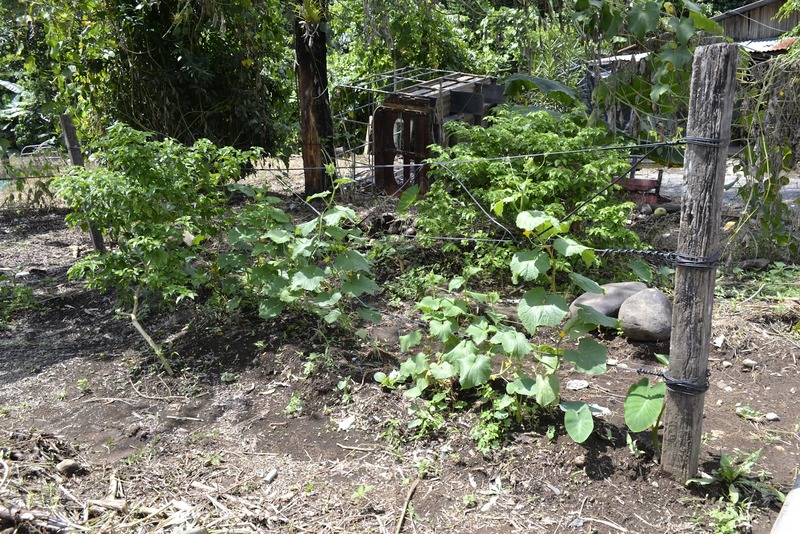 She grows coriander, celery, cucumber, cauliflower and other vegetables which are not common in the Guapiles region of Costa Rica. Following is a comparison of cucumber plants under organoponic system in a polyhouse 2 weeks after transplanting and in field conditions (control). 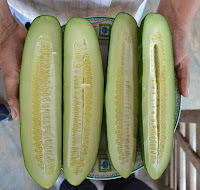 In two weeks the tender cucumbers started appearing in organoponic system while in the field the plant was still in the initial flowering stage. 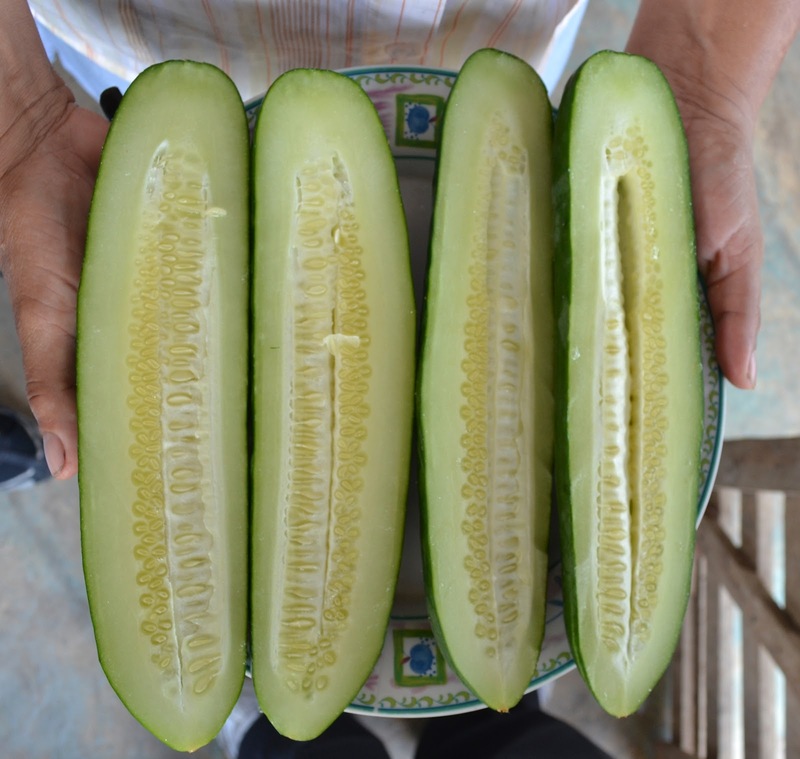 The organic cucumbers were very juicy, filled with flavour and tastier. Maria and her husband Gerardo regularly make compost which is popularly called as Tims compost or Tims tomb (I am referred as Tim in short and farmers in Costa Rica call the compost by my name !). 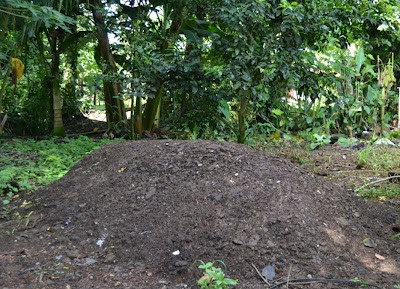 Tims Compost technique is very popular in Costa Rica as it does not require turning and regular maintenance like other composting methods. All the available biomass comprising of crop residues, animal wastes, weeds and leaf litter etc are used in composting. 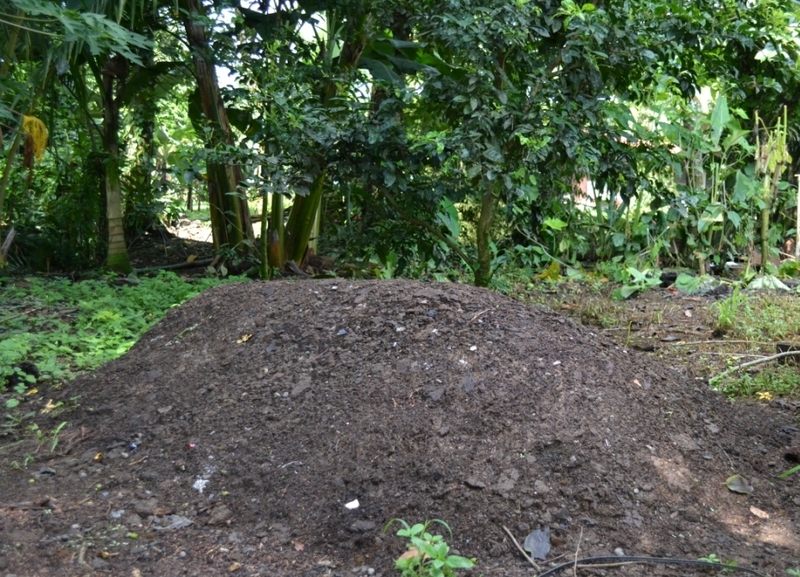 Compost is used for vegetables and other crops. Maria has been an innovative farmer and a leader in promoting climate smart agriculture technologies. She doesn’t keep the knowledge for herself rather she organizes regular meetings with the farmers of the region and trains then in low-cost organic agriculture techniques. Many farmers are her ardent students and follow these simple practices at their respective farms. 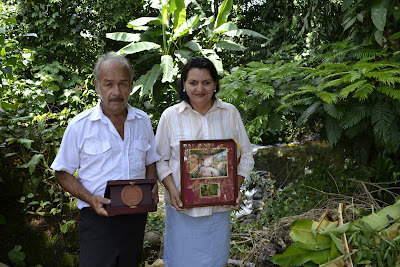 In recognition of the great work of Maria Luisa she was awarded ‘Medalla al Merito Agricola (Medal of Merit for Agriculture) by the Ministry of Agriculture, Government of Costa Rica in 2011. Thanks to the Government of Costa Rica for supporting and recognising organic agriculture and rewarding the innovative farmers of their country. This is an example for many farmers and governments across the globe to emulate and replicate in their regions.